Cait and I took a little trip up to Bellingham yesterday and of course…it rained all the way up there and for a good hour after we got there. I am glad that I decided to stick around otherwise I wouldn’t have caught this! As always, beautiful. The pier or bridge seems to go forever. It lead my eye through the whole photo :). What an amazing shot! I love the dramatic sky and the glow from the setting sun. Good one David. Like the infinite focus and looks like a perfect sunset. Good shot – is this the same beach where Jolene was shooting the wrecked boats? Thank you Mike. It is the same beach and you can actually see the shipwrecked boat on the right side of this image. For those who have not seen Jolene’s image, here’s a >>link<<. Yes sky meets the sea and the bridge too.. I really like this one with the colors, it sort of looks like the earth’s on fire. Great job on the extra wide angle. I thought the same thing with the fire Martina! I love clouds, is that an odd thing to say? 😛 As always, thank you for the comment. I stumbled upon your blog recently, and have been enjoying your photos every day. I’m a newcomer to photography, about 3-4 years now, so I feel I’m still learning lots every day. Great shot! I love the sunset hitting the bridge rails, looks like it’s turning them to molten metal. Hahaha, I like your thinking Jim! Thank you for the comment. Very nice HDR David. Looks like you are getting the hang of it. I love the composition of this shot and the sunset is gorgeous. Thank you Emily, I think I am starting to get the hang of a more “realistic” HDR. Very subtle HDR David. I like the colour of the sunset creeping up through the bottom of the clouds. Nice shot! 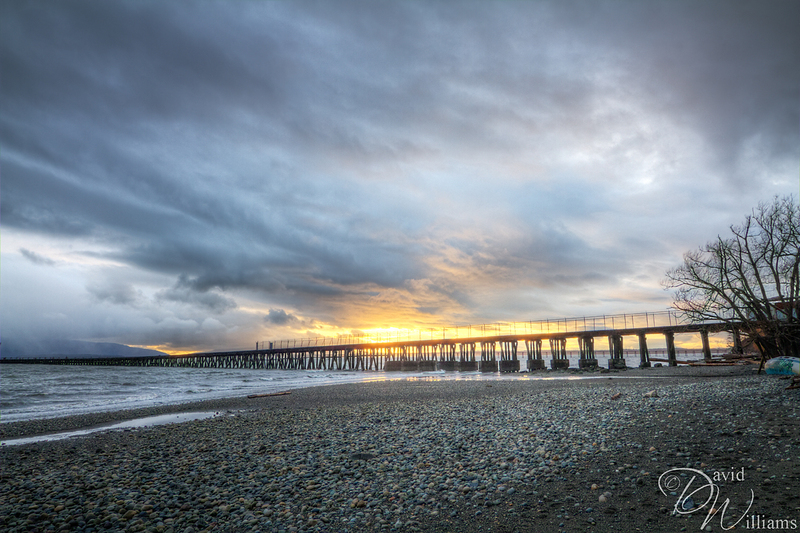 Thank you Mike, I think I am starting to get the hang of getting more subtle HDR…practice practice practice!